BETHLEHEM (Ma’an) — Over 400 Palestinians in the occupied West Bank have been displaced due to Israeli demolitions during the first six weeks of this year, a senior UN official said Wednesday. The number of Palestinians displaced in 2016 is already equivalent to over half of the total number displaced in all of 2015, the official said. The UN documented 283 homes and other structures destroyed, dismantled, or confiscated between Jan. 1 and Feb. 15, many of which were located in the Jordan Valley. 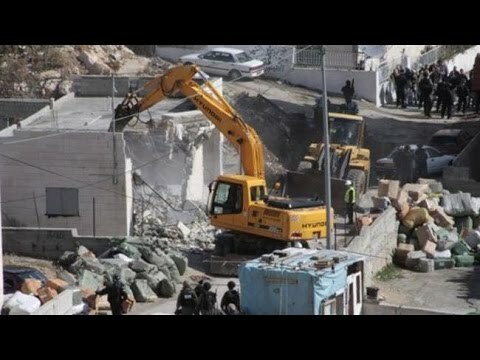 A number of demolitions carried out took place in Palestinian communities whose land has been designated by Israel as “closed military zones,” where military exercises have historically been carried out in effort to drive Palestinians from their land. “International law is clear — Palestinians in the West Bank have the right to adequate housing and the right to receive humanitarian assistance,” said Piper. “As the occupying power, Israel is obliged to respect these rights,” the UN official said. Repeated calls by international bodies for Israel to cease the displacement of Palestinians living in the occupied Palestinian territory have done little in the past to stop ongoing demolitions or settlement expansion onto Palestinian land. The EU earlier this week condemned Israeli policy regarding demolition and settlement expansion that the body said made the possibility for an independent Palestinian state impossible.